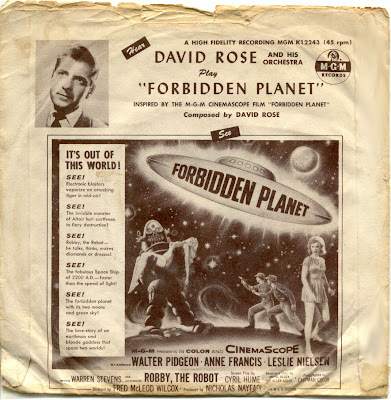 I posted a few songs from the movies the other night...okay, so Forbidden Planet wasn't actually used in the movie, but it was "inspired" by it. 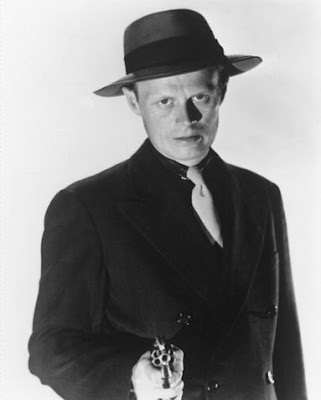 Here's another movie-related song, by the original Kaleidoscope (David Lindlay and friends) from around 1970...inspired by Richard Widmark's character in Kiss of Death (1947), Tommy Udo. Gotta love a psychotic gunsel who ties a stool pigeon's mom into her wheelchair, then throws her down the stairs! And his laugh...it has to be the inspiration for Frank Gorshin's laugh as The Riddler. A great one-sided record...the flip, The Swan, is pleasant, but undistinguished. This record was sampled for a Lucia Pamela record...and served for several years as the theme song to WMUR-TV's yuletide Santa Claus show, featuring a thinly-disguised Uncle Gus Bernier. 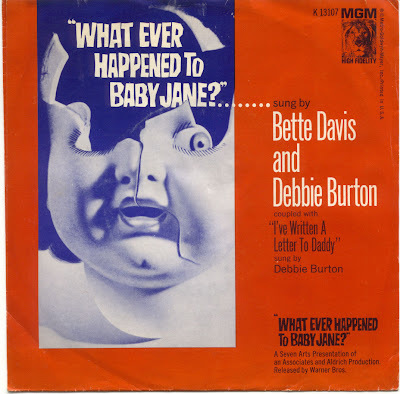 There are no credits on this record...just a plug for the movie and the composer credits (Ervin Drake and Paul Durand). 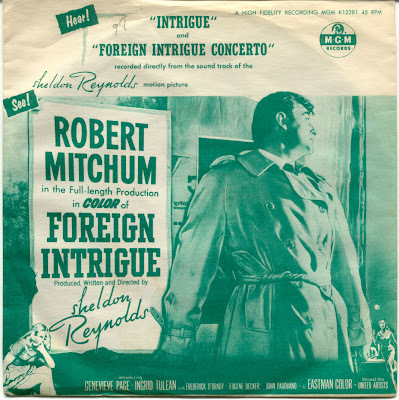 The flip, Foreign Intrigue Concerto (by Charlie Norman...the composer gets credit, but the orchestra and pianist don't) the finale, with spooky French horns restating the theme against an even spookier string chord, used to creep me out as a young child (five or six years old). And Bette Davis joins her (in character!!!)http://www.box.net/shared/87ef3vosv1 . And yes, this catchy ditty does show up in the movie...as an instrumental played on a transistor radio in the final scene at the beach. Whew...that'll do it. I've got to go for popcorn. When I was transferring those four NYC country novelties a couple of weeks ago, I noticed one of the characters on the Manning record counting up...but with a twist...he substitutes the syllable "uh" for the number seven. Well, that tickled me, for I knew what the joke was. This reminded me that there was a Warner Brothers cartoon from 1936 or so that also contained an "uh" for the number seven...and a "woof woof" for ten. 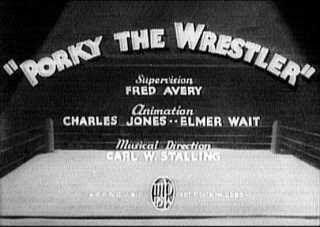 It's an early Tex Avery WB cartoon, Porky the Wrestler, from early 1937: http://video.aol.com/video/porky-the-wrestler/1789305 and the sequence is in the final minute. The wrestler actually says "uh-uh" which throws 8 and 9 off by half a beat. But the audience "woofs" twice and that joke ends. It all started in February of 1936, when Hezekiah Leroy "Stuff" Smith and his Onyx Club Boys recorded their I'se A-Muggin' routine (I can assume the song and musical counting game were quite popular at the Onyx and the Brunswick/Vocalion brass smelled a hit record). NYC, 11 February 1936: Jonah Jones, trumpet; Stuff Smith, violin & vocal; Raymond Smith, piano; Bobby Bennett, guitar; Mack Walker, bass; John Washington, drums. Interesting note: Bud Freeman plays on both Victor/Bluebird versions...recorded 2 days apart. NYC, 10 March 1936: Charlie Teagarden, trumpet; Jack Teagarden, trombone & vocal; Jack Cordaro, clarinet; Frank Trumbauer, c-melody sax; Bud Freeman, tenor sax; Roy Bargy, piano; Carl Kress, guitar; Art Miller, bass; Bob White, drums. In my opinion, this was the best of the copy versions of Muggin'. Then again, any band that had both Jack and Charlie Teagarden, Tram, and Bud Freeman couldn't be too bad. 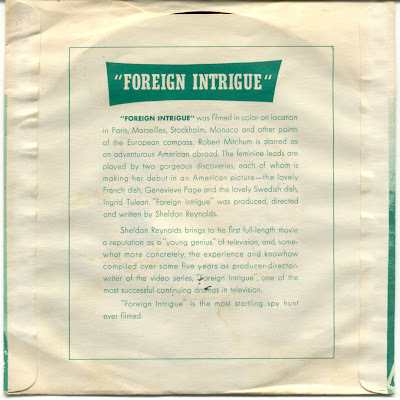 One wishes there had been more recordings by this Whiteman-sponsored group, but there weren't...although some broadcast material has recently surfaced. NYC, 12 March 1936: Frank Newton, trumpet; Mezz Mezzrow, clarinet; Bud Freeman, tenor sax; Willie "The Lion" Smith, piano; Al Casey, guitar; Wellman Braud, bass; George Stafford, drums. Recorded at the RCA studios two days later for RCA's 35-cent Bluebird label. When the musicians are playing, all is great, but during the numbers game on side two, the musicians seem a trifle bored. Maybe it's because they waxed four other titles at this session. Bud Freeman returns after the less-than-inspired counting to rescue the record. On 11 March 1936, Decca got into the act by recording Andy Kirk's version (with his Clouds of Joy, of course)...but I don't have that recording yet. The RedHotJazz website aparently has a copy at http://redhotjazz.com/cloudsofjoy.html , but the link seems to be dead at the moment. NYC, 11 March 1936: Cliff Weston, trumpet & vocal; Gordon (Chris) Griffin, Zeke Zarchy, trumpets; Mike Michaels, Frank Llewellyn, trombones; Leo White, Edgar Sarrason, Freddy Fallensby, Ben Harrod, reeds; Bill Miller, piano; Brick Fleagle, guitar; Jack Fay, bass; Charlie Bush, drums. A rather hot version, with a more-or-less rhymed list of instructions...and they trim around 30 numbers out of the counting game. NYC, 12 March 1936: Hal Kemp, clarinet and alto sax, leader; Earl Geiger, Russ Case, trumpets; Wendell "Gus" Mayhew, Eddie Kusby (Kuczborski), trombones; Harold Dankers, Ben Williams, Saxie Dowell, reeds; Dowell, vocal; John Scott Trotter, piano; Phil Fent, guitar; Jack Shires, bass; Skinny Ennis , Maxine Grey, speaking roles only . Recorded the next day (and only three matrixes later), ARC's more expensive label, Brunswick, gets a version too. This was first version of the tune I ever had...I've had this copy for around 35 years. This was the only version that did a takeoff on "oh no, sir" bit that Stuff did on his record...and they got a full chorus of the song and a whirlwind count too. It's also a lot hotter than most of Kemp's post-1934 sides...his records usually were safely catalogued in the sweet/Mickey Mouse section. Paris, 4 May 1936: Stephane Grappelli, violin; Django Reinhardt, Pierre Ferret, Joseph Reinhardt, guitars; Lucien Simoens, bass; Freddy Taylor, vocal. The Muggin' fad finally had hit Europe, and Freddy Taylor (black tap-dancer and vocalist) does a fair vocal, even if he does mangle the names of his supporting musicians..."Dango" and "Steven" must have loved that. Mercifully, they don't count on this version.. I think there might have been other versions recorded in Europe at around the same time...but will I look for them? Ron’s right, of course, but he didn’t produce he title. He gets the First Runner-Up prize, a Komodo Dragon (and he now knows the song title I’m looking for). Uncle Eugene's Special Aged Peanut Butter Sandwiches will have to age a little longer. And the song (several versions!) will be posted by Saturday night. 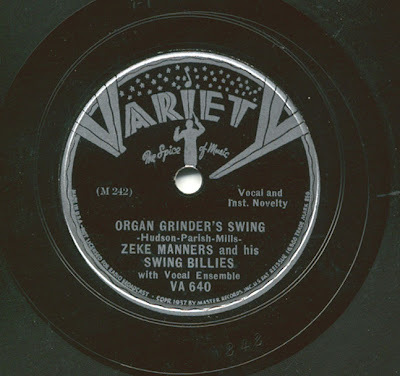 On one of the Zeke Manners records I posted (Organ Grinders Swing, at 1:20), when somebody starts counting up (they're going to the toy shop on the eighth floor), he says "five...six...uh...eight." Hats off to all correct answerers...and a lifetime supply of Uncle Eugene's Special Aged Peanut Butter Sandwiches to the first correct one. I'll have the correct answer up someday soon...I'll give y'all a couple of days to think about it. Broadcast 28 June 1942: Duke Ellington, piano & leader; Wallace Jones, Ray Nance, Rex Stewart, trumpets; Tricky Sam Nanton, Lawrence Brown, Juan Tizol, trombones; Chauncey Haughton, Johnny Hodges, Otto Hardwicke, Ben Webster, Harry Carney, reeds; Fred Guy, guitar; Junior Raglin, bass; Sonny Greer, drums. An interesting curiosity: During a broadcast of the Ellington band, an unnamed announcer interrupts Ben Webster’s solo with a PSA for the American Legion’s record recycling program (Our normal source for shellac had just been taken by the Japanese). When the announcer finally shuts up that's Rex Stewart you hear on cornet, squeezing out freak notes with his half-valve trick. 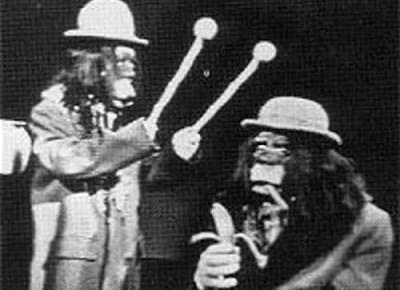 Broadcast 2 February 1943: From the Fibber McGee and Molly radio show, an integrated commercial for Johnson’s Wax. In this show, Fibber and Molly (Jim and Marion Jordan) had just opened their famous closet. This time, in the wreckage, they find a box of old phonograph records. Harlow Wilcox steps in for a quick plug for Johnson’s Wax. The regrind program is mentioned in passing, but it’s the records that they pull out of the box that may interest the 78-collecting community out there…there’s somebody's version of Tell Me, Pretty Maiden (from 1902), an Uncle Josh record (http://ia311515.us.archive.org/0/items/CalStewart_part2/CalStewart-UncleJoshInaChineseLaundry.mp3 originally recorded in 1901, but available for many years), and Cohen on the Telephone (http://www.raeproductions.com/music/cohen.html from 1913) . It occurred to me that the records in the closet go back to around 1913 or so...or around thirty years before this commercial. That'd be like me finding a stash of disco and heavy metal LPs in my closet. However, I wouldn't feel too nostalgic about finding that dreck...it'd go to the nearest thrift shop and donate them. You can find the virtually complete Cal Stewart (Uncle Josh) catalog at the Internet Archive: http://www.archive.org/search.php?query=creator:%22Cal%20Stewart%22 . Recently, I had mentioned to another friend that one of my favorite country records was being sold on eBay...and he had (more or less) forgotten what the record sounded like. So I thought I'd post it for him (and for you, dear readers). Atlanta, 18 October, 1927: G. B. 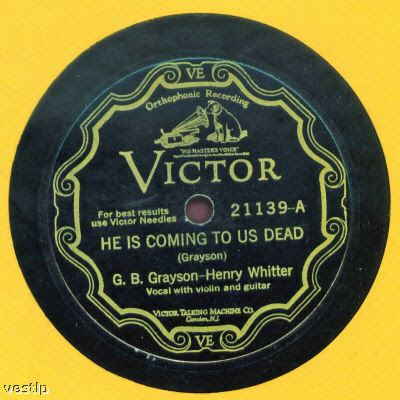 (Gillam Bannom) Grayson, fiddle & vocal; Henry Whitter, guitar. Grayson was the nephew of Col. W. M. Grayson, who arrested Tom Dula in 1868 for the murder of Laura Foster. The arrestee's surname is actually pronounced "Dooley;" it's a regional quirk similar to the reason the Grand Old radio show is pronounced "Opry." So...while I was in a posting mood, I thought I'd include the first recorded version of Tom Dooley as well...by the nephew of the guy that brought him in. It's quite different from the Kingston Trio's version. Memphis, 30 September 1929: Same personnel. Quite a few of their records are cautionary tales, either songs about husbands/fathers who are drunkards or old murder ballads like Omie Wise and Rose Conley (I may get around to posting those sometime...there are many musical variations on the 1808 murder of Naomi Wise, the subject's the same, but the treatments are quite different. )...most have G. B. yelling out "take warning!" somewhere. Their I'll Never Be Yours is another take on The Banks of the Ohio (complete with a drowning murder, of course...). All of their works are available...I have them on 2 Document CDs, but there's a single volume that contains the cream of the crop, and probably in better sound. HICTUD is seldom found in really great condition...my 78 of it sounds about as worn as the one that Parth used on his CD. Let's flip the Holmes record over for another Kovacs-related number, Oriental Blues. And. 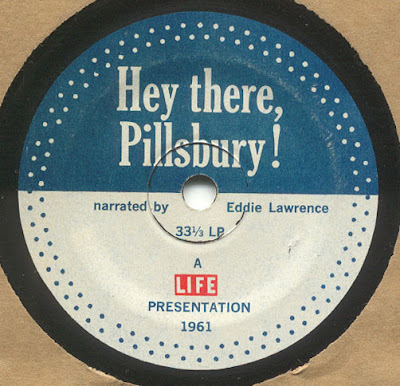 finally, a weird item...a 7-inch one-sided 33 rpm single, with a special Pillsbury label (and a blurb saying "A Life Presentation 1961." Apparently there was a tie-in with Life Magazine...more to come on the connection as the info becomes available). It's called Hey There, Pillsbury! and it's by none other than the Old Philosopher himself, Eddie Lawrence. NYC March 1937: Zeke Manners, piano-accordion –1; unknown, electric steel guitar; unknown, guitar; unknown, string bass; unknown, ocarina –2; unknown, bazooka or slide whistle; possibly unknown, xylophone –3; possibly unknown, washboard – 4; unknown, traps -5; unknown, bell –6; unknown, train whistle effect –7; Band, vocal and speech. Members of the band are addressed on Mx M-242 as Ed, Hank, Bob, Bill and Ace. Hank appears to play the bazooka or slide whistle, and Ed may play electric steel guitar. For what it’s worth, the other two sides in the session may have Elton Britt’s yodeling on them. 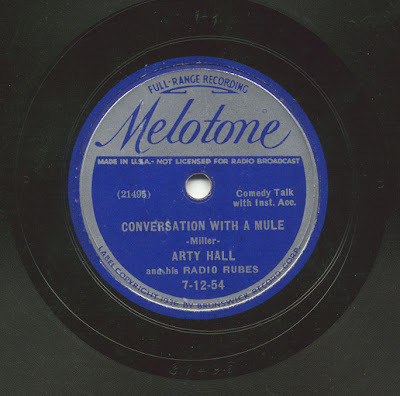 Arty Hall and His Radio Rubes did two sessions for ARC in 1937, six were recorded at the first session and all were issued. The second session produced six more sides, but only one was issued. NYC 8 October 1937: Arty Hall, two unknown, vocal trio; unknown, fiddle; unknown, accordion; unknown, guitar; unknown, harmonica & Jews harp. I think these sides are rather fun, in a Hoosier Hot Shots vein...light novelty fare without the bombast that Spike Jones would offer in a few years. Oh...before I get any nasty comments, I do like Spike, and have a couple of unusual items that I'll post sometime in the future. Another Music Post! ~Calcutta, 1902! 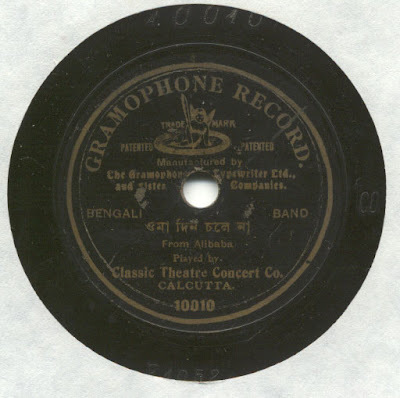 It was made on the first recording expedition to India by Fred Gaisberg and was recorded on Sunday 16th November, 1902. The title in English is "Oma Din Chalena". E1052 is the matrix number and 10010 is the catalogue number. This mp3 has no enhancement/noise reduction or anything...it's the raw file (so the person interested in this record has a better idea of how it actually plays). I hope this works...it's another first here. 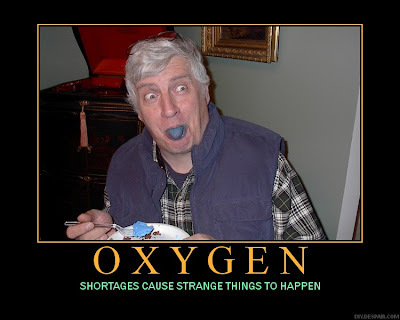 Yup...testing again...this time to see how to load pix. Methinks this one looks okay, if a bit silly.